At the end of each conference previews run-through, I take a look at how I perceive the conference’s balance of power heading into the season. This is in no way based on schedules, so they are not predictions. This is just how I would rank the teams after writing thousands of words about each of them. We have already completed the MAC, Conference USA, and Sun Belt. Here’s a link to every team’s data, and each team’s name below is linked to its preview. For all intents and purposes, this has been a two-team league over the last couple of years. UCF is 18-0 in AAC play since the start of 2017, and Memphis is 12-2 against teams not named UCF. Granted, they’re also 0-4 against the Knights. The losses have been increasingly painful for Memphis. 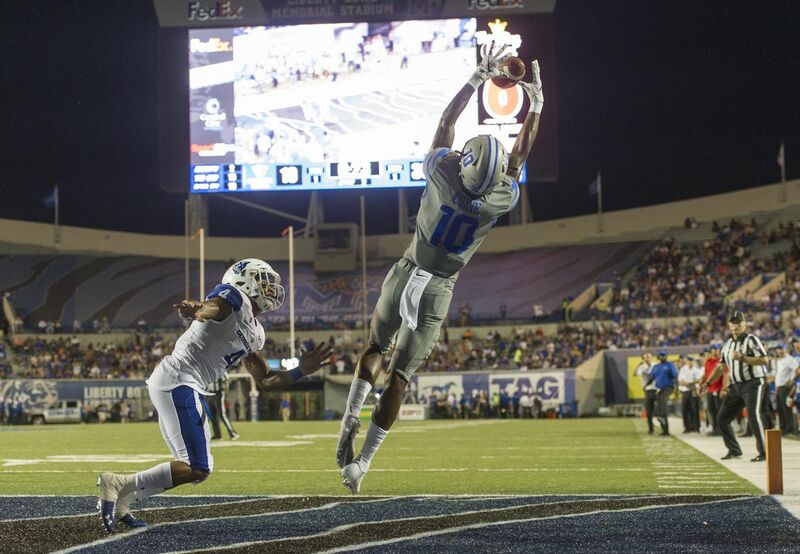 UCF won the 2017 AAC title game in double overtime, then Memphis blew leads of 30-14 and 38-21 in 2018. From a #narratives perspective, we tend to think of this as Memphis being incapable of getting over the hump or UCF simply having Memphis’ number or whatever. But streaks and narratives end. And if these two meet in the AAC Championship for a third straight year this fall, as the numbers project, Memphis could very well have the pieces. 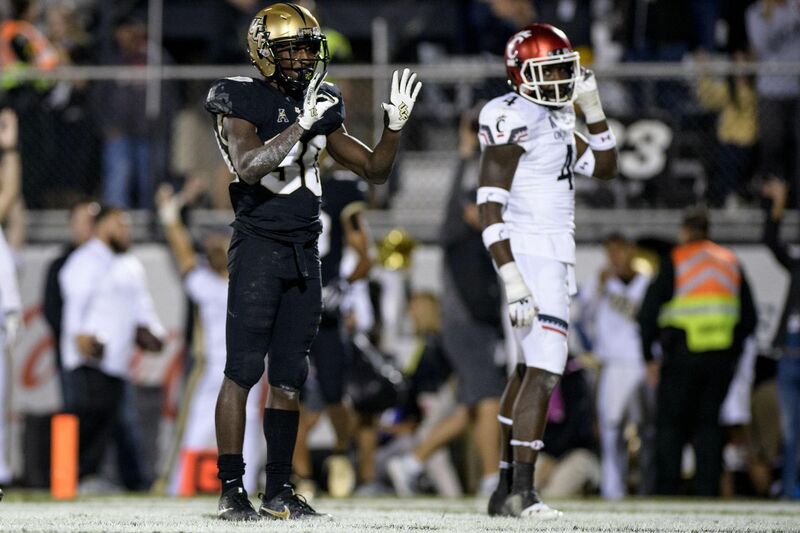 The Tigers are insanely explosive and experienced, and UCF is without injured star quarterback McKenzie Milton and has to totally rebuild its defensive line. The Knights are still the king of the conference until proven otherwise, and I’m feeling extremely queasy starting anyone else atop the power rankings. But I’m pretty damn confident in this Memphis team. We’ll see if I’m wrong. Of course, Memphis and UCF still have to get to the conference title game first, and any of these four teams are just an upset or a single breakthrough player away from rearranging the balance of power in the conference. 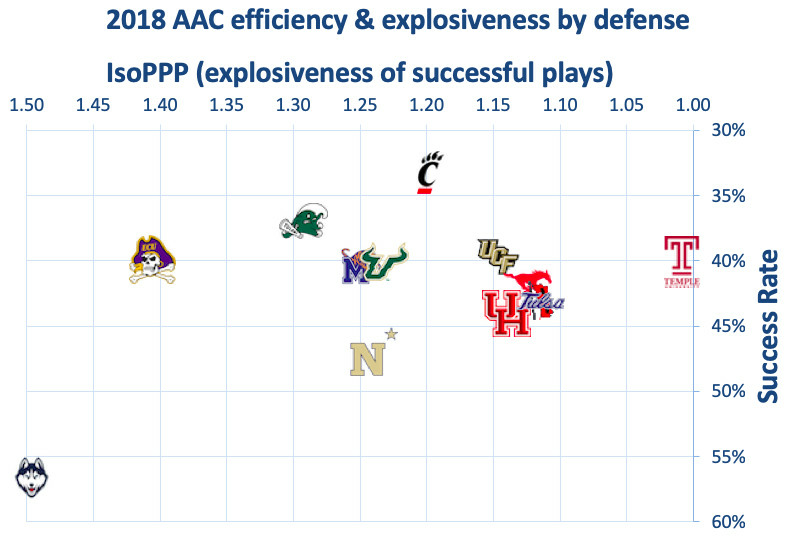 Cincinnati seems the most likely of the four, but usually when you experience a sudden surge, like the Bearcats did in 2018, you’re happy to hold steady the next year. They might need one more season before they are ready for take down the Knights. But they might not! The goal for these five teams is bowl eligibility. I figure three of them can achieve it. At ECU, Mike Houston inherits far more pieces than you probably think. Navy could easily get back on the right side of .500 with a steadier quarterback and remodeled defense. Tulane and SMU are pretty likely to take two of those three bowl spots, though. I love unexpected comeback stories, and I would very much enjoy UConn rebounding defensively, continuing to make offensive improvements, and maintaining bowl hopes into November. It’s just hard to see it after last season’s historically bad defensive effort. Indeed, with what Memphis and UCF return in 2019 (and how they’ve been recruiting), S&P+ has no reason to think this is anything other than a two-team race so far. Or maybe a 2.5-team race. Projected conference wins, with overall wins in parentheses. This year’s home-road splits could help make these division races more interesting. Memphis travels to Houston on November 16, sandwiched in the middle of a ferocious November that also includes a trip to Cincinnati and visits from USF and SMU. The Tigers should enter the final month as the favorite, but there are constant landmines down the stretch. The road is tricky for UCF, too. The Knights only have a projected 1.1-game cushion here, as opposed to Memphis’ 1.8, and they have to go to both Cincinnati and Temple. 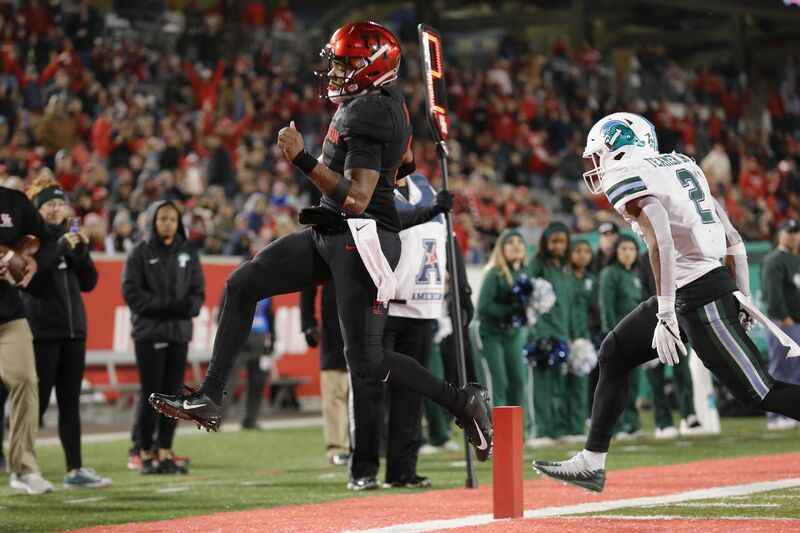 if Cincinnati can beat UCF in Nippert, this race will likely be a dead heat. 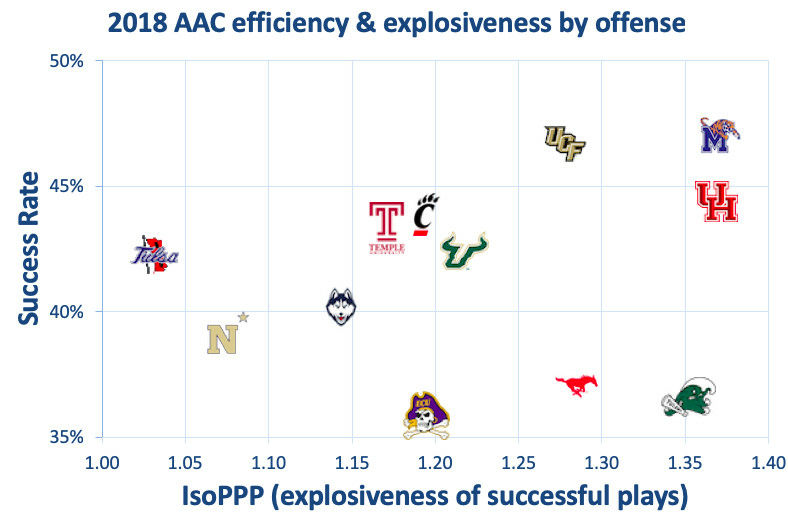 This league had a little of everything, from all-or-nothing and run-heavy Tulane, to all-or-nothing and pass-heavy SMU, to a smattering of more efficiency-based teams, to all-and-all Memphis, Houston, and UCF. Those three offenses should again be the torch-bearers. 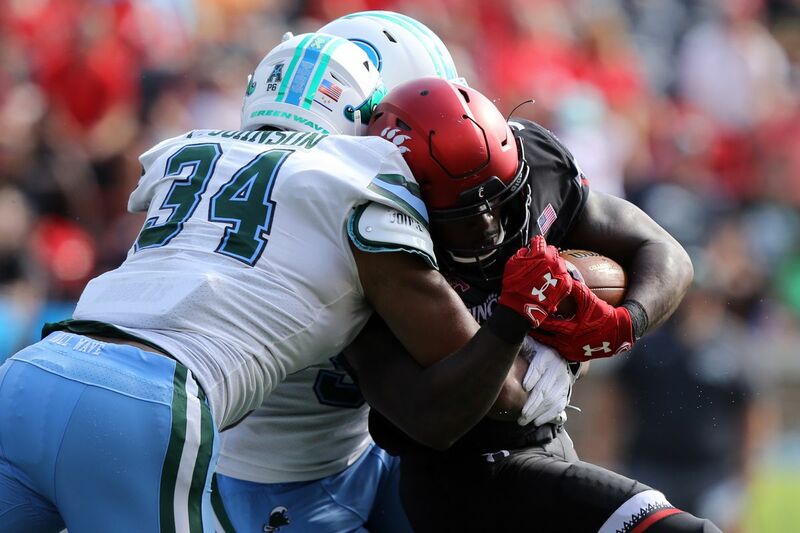 Navy’s defense was horrid. ECU’s was fun but glitchy. UConn’s was … so, so, so much worse than either one. I’m not sure I’ve ever had a unit screw up the scale for a chart like the Huskies did here. Historic. Memphis and UCF both have absurd depth, but King would have had about 3,700 passing yards and at least 1,000 non-sack rushing yards last year had he not gotten hurt late in the season. He’s absurdly fun, and it’s easy to assume he and Dana Holgorsen will get along well. This league overflows with standout pass rushers. Johnson was probably the best of the bunch last year — and according to PFF, he was dynamite dropping into pass coverage, too — so I’ll give him the nod over Huff, Jefferies, and Hampton.